You are currently browsing the tag archive for the ‘Rosy Periwinkle’ tag. 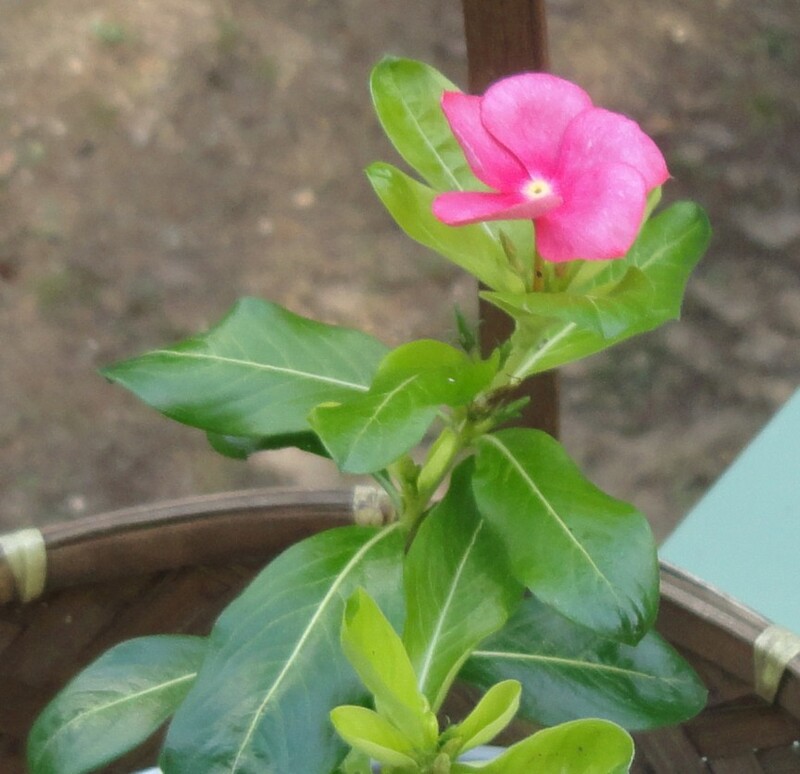 As a thank-you gift for judging a flower show I received a pot of Catharanthus (clear or pure flower) roseus (rosy colored), or Madagascar periwinkle or rosy periwinkle. I grew these in St. Charles as an annual and loved them. I don’t run into them that often here in Northern Michigan, but maybe I’m going to the wrong nurseries or not paying attention to the annual departments. I usually shop for perennials. My gift made me think maybe I need to shop better. Hybridizers have worked with this plant and produced the beautiful varieties available today. Warning: the sap can be poisonous. This means when children are around, you need to be extra careful they do not pick or eat the flowers. Catharanthus roseus makes a colorful display from summer to fall for border or container plantings; sun or lightly shaded areas suit them best, but they perhaps needs a longer growing season than available where I live. I’ve read where they are very slow developing from seed, so planting outdoors isn’t an option here. Rosy periwinkle likes moist soil, not wet, soil and will tolerate dry. This generally means the plant lives on dry sites but looks awful. I left mine in its container and may bring it in this fall to see how it overwinters (not crossing my fingers). In colder climates it is grown as an annual for its abundant five petal flowers of pink, red, or white with a deeper pink star in the middle. The plant’s therapeutic uses came to the attention of Canadian and American medical researchers during World War II when they learned that soldiers stationed in the Philippines used Madagascar Periwinkle leaves to substitute for unavailable insulin. During the 1950’s… the researchers found them to have no appreciable effect on blood sugar levels, but they did reduce the white blood cell count in laboratory animals without significant side effects. More recently, 2 alkaloids in Madagascar Periwinkle leaves, vinblastine and vincristine, were identified as active anti-cancer agents that could be used in chemotherapy. Vinblastine is used for patients with Hodgkin’s disease and vincristine is used for children with leukemia. With the introduction of vincristine, the survival rate for children with leukemia jumped from 20 to 80 percent. They also mentioned that during WWII soldiers in the Philippines used the plant to control diabetes when insulin was in short supply. I had no idea anyone with diabetes would be inducted into the army, so there was a surprise. While a beautiful plant, its potential as a medicine makes me think about our many different ecosystems and what grows there. If we destroy even one habitat, make one plant extinct, we might well be destroying a plant with great potential for human well-being.